The main results of the complex Brexit negotiations between the United Kingdom (UK) and the Member States of the European Union (EU) must preserve, in order of importance: the peace in Ireland, the territorial integrity of the United Kingdom and the free movement of persons, capital, goods and services, and do everything possible to maintain cordial and cooperative international relations, in order to promote economic and cultural activities between them. – In the special case of Ireland, for the persons, the UK with the Irish Republic are today outside of Schengen and nothing changes with the accord of « Good Friday » in 1998. May be, the passport will replace in the continental EU the European identity card. For the precedent reasons, by a special bilateral Free Trade Agreement called « a combined customs territory » in the Chequers Plan, this disposition would be not applied in the island of Ireland between the Northern Ireland and the Irish Republic with free movement of persons, dispositions already in place today, in order to avoid a border in Ireland and preserved the peace. (These dispositions would place, with many advantages, the Irish Republic in the best economic position in EU to commerce and make a privileged link between for: first with the EU and secondly the UK after the Brexit, the subject of this next article). – For the capital with the IT technologies, do not worry for the City to maintain its first leadership place in the world. – For the goods and services, the European Single Market makes the job in an environment where, at the end, there is no taxation in business. This European Single Market defines the absence of border between countries and by consequence the peace in Ireland. These are the problems that need to be solved. I think with the new MOSS in January; the indirect taxation and VAT paradigm used in Europe since 1993 through the European Single Market show, in its actual form, a completely outdated system. This system produces an incompatible environment to find a correct solution between UK and EU in the context of Brexit. In the coming years, all the European countries will have digital tax returns to the tax authorities (which I describe in 2012 in DAGTVA), soon in Italy, Greece, Portugal, Hungary, Romania, France, etc. as is already in function in Spain with « SII » or China for example. UK with “MTD” will join in April 2019 the list, outside the EU, of multinational countries with the GCC, India. For a new paradigm, United Kingdom, in its next situation with the Brexit, will show the way. An example with a B²B cross border transaction Spain to UK, the seller is in Spain. 1) A local digital statement in Spain with “SII” must be done. 2) « A second » foreign statement Spain to UK with “MTD” will be not requested on 1 April 2019, but certainly in the future. Already today « MTD » asks to the foreign businesses to bring the orignal proof of the VAT registration in their local countries. 3) An UK local tax return with “MTD” must be done by the buyer. In fact, when the invoice is created in Spain and the tax notified on the bill, declared in Spain and in the foreign “MTD” tax returns (application of the foreign statement not yet requested), at this stage of the transaction, it is not a VAT tax, even if the word VAT is written at the bottom of the bill. It is an output tax or a tax on production. At this moment, the value of this output tax is already the property of buyer’s country (UK). It is specified in the guidelines’ aims of EU and OECD, where the tax should be taken in the consumption place. I wrote above that the foreign “MTD” tax returns will be not requested today, but the local tax return in UK will be mandatory. Now, with the “MTD” statement done, only one of these declarations are sufficient and the UK has all the means to levy the tax specified on the invoice. I think, the UK in this position, will levy directly the tax on the UK buyer’s payment. With a consequence, all the management of the indirect taxation (VAT) is in UK and there is no law to forbid this technical operation to an independent country, operation granted by the EU to Italy with another form of split payment in B²G, a case law that encloses the EU in its own decision. The buyer who has already pays the output tax, transformed now in an input tax in UK, pays the foreign seller, “NET amount”. He will not want to pay the tax twice! To respect the seller accounting balance, by the same IT means and the mandatory VAT registration, HRMC will inform the foreign seller by e-mail and will give a receipt that the UK tax authorities has took the output tax and will give also the custom informations (stickers and barcodes for the delivery) for facility the UK importation’s control, if necessary. After the Brexit, the UK is outside the EU, I cannot believe that the UK refunds a tax on production in Europe or elsewhere. Like today, with this system, there is no tax in circulation in the European Single Market but the process is simpler, the « physical » presence of the output tax is not included in the payment’s circulation between the cross border companies. The fraud will be impossible. By reaction, of course, if the European companies will be paid “NET amount” by the UK’s companies, they will also paid “NET amount” the UK transactions. This same clear process will impose by the UK tax authorities to apply a small modification in the account software’s in Europe to take in consideration this levied tax or apply a manual accounting entry. The UK in this situation obliged the foreign seller to enter in its taxation system and the UK will be the master in the cross border transaction. I think the next countries to apply quickly this system, after the Irish Republic in the actual or inside the future context of Free Trade Agreement called « a combined customs territory » in the Chequers Plan, are Italy and Greece infested by Chinese products in the Piraeus harbour. UK will impose also to the Chinese companies to apply this system now around the world and used by default in Italy and Greece. It is not a problem for China to apply these constraints with the digital invoice statements already in use this country. By the same reaction, China would apply the payment « Net amount » and indirectly participate of the destruction the European Single Market in its actual form! This system will be applied between B²B with the consequence of producing a nuclear chain reaction in all companies which commerce with the UK and elsewere. The European VAT and PSPD² directives will probably burst to make place this new paradigm and I think it is impossible to stop the arrival of this concept. It is the end of the European Single Marked as we seen since 1993. It is replaced by a simply system with the same qualities, without tax. For the « new » MOSS it is finish, before having lived, the MOSS is dead! It is not the VAT apocalypse; the concept of VAT is not in danger. This tsunami prefigures the new European Single Marked. With that you have read in this text with China, I can now replace “European” by “World”, to create with this system, the new “World Single Market”, without tax. To close these some words, you think the UK has all the keys in hands in the Brexit negotiations’ (in the taxation environment) and it is the winner of this operation. I think no, it is a system “winner / winner”. In the UK environment, we can find a situation, like today, without border countries in Europe, the preserved the peace in Ireland with the UK territorial integrity inside the European economic space. In the Europe side, remember you the difficulties to mobilize € 315 billion of investments in the Juncker Plan in 2015 only one time. EU with this new paradigm will recover for the European States of € 200 billion of fraud each year! Each year! Each year! It is, may be, the crisis’ end in Europe with the UK inside because, I think, it is impossible to move the UK between Wallis and Futuna! Decidedly, the UK is in Europe! By chance, the history are repeated, it is still again, after the two world wars, indirectly the UK will come to the rescue of old Europe unable to reform and propose a correct solution in the Brexit. The Boys can rest in peace in the huge cementeries in Normandy and elsewhere, their grandchildren will be present to continue the job! Nobody likes tsunamis and the EU will face at a dilemma. Its will have to choose between the UK-imposed tax tsunami in Europe and elsewhere and the end of the crisis in the 27. But the EU had already been warned of this tsunami by the recommendations by a panel of experts in taxation with PwC. A study in 2010 in the context of the « Green Paper on VAT » and its final report, on what needed to be adopted in Europe to have a more just and efficient indirect taxation. It was the Big Bang that was announced for 2020 on page 11 and 12 of this document, about the split payment model*. Exactly the date of Brexit! Now, the Big Bang is coming soon, nothing will can stop it and this document allows the EU to get out of the negotiations, without losing, by applying the European and PwC recommendations before it’s too late. *(Avalara : You can read about the split payment model, which arrives quickly from USA by the marketplace providers to collect sales tax, details in this article by Gail Cole – 30 October 2018). 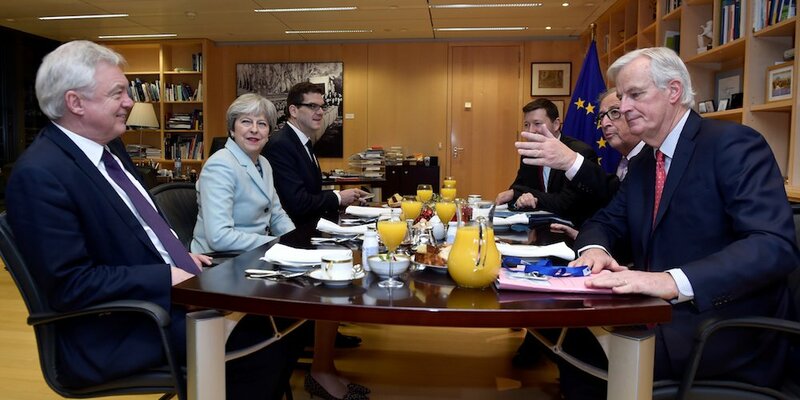 Before January 2021, at the table of the European negotiators, I will choose to go ahead by adopting, in a first time, the project elaborated at « Chequers » in July like a base of an agreement, which seems a reasonable intermediate solution and brings time to prepare the fiscal wave for later. It is urgent, for the EU, to take in consideration these new possibilities and modify the paradigm for levying the indirect taxation in Europe. I do not see another logic solution with the same and complete advantages for the future to solve correctly the problem of Brexit in the peace and economy preservation. You can see, this technical solution is not influenced by the outcome of the actual negotiations, whether there is an agreement or not between UK and EU. With the Brexit, UK will be on the pole position to implement a new tax system in accordance with the European goals and in the world. It is not a coincidence if, after « MTD », the UK has asked for a study on the split payment. To conclude, for a negotiation to succeed, it is imperative that there are only winners among the negotiators! That is the future what everyone wants and OECD proned for having better policies for better lives. Partager la publication "Brexit and the future of VAT"